If I’m being honest with myself, I probably eat ice cream six days a week. What can I say? It’s my vice. My love of frozen, dairy-based desserts also extends to frozen yogurt – especially from Pinkberry. My family and I used to live in San Jose, in close proximity to a Pinkberry shop. My wife and I frequently made “special treat” trips to Pinkberry with our young kids. Naturally, I downloaded the Pinkberry app, loaded it up with money, and…well…let’s just say we spent a lot of money on (“healthy”) frozen yogurt. But then we moved. The closest Pinkberry is now 20 minutes away, and we’re a busy family. Suffice to say, it’s been months – yes MONTHS – since we’ve been to Pinkberry. I missed Pinkberry, but even though I loved their product, I couldn’t quite work up the motivation to go back. So why am I telling you about this? Because I wasn’t the only one who missed my relationship with Pinkberry. 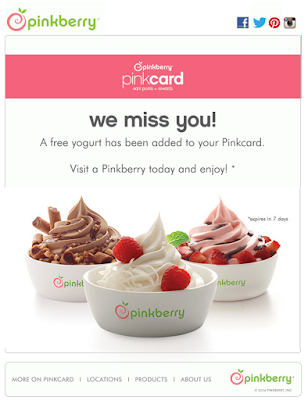 As any smart company should, Pinkberry made it known that they missed me, too. First of all, how did Pinkberry know that my family and I had gone AWOL? That’s easy – they knew I hadn’t used my iPhone app. This is one of the biggest benefits to creating a mobile app for your product or service – it’s easy to monitor activity. They knew I hadn’t purchased anything in months, because I would’ve taken advantage of the money pre-loaded on my app. They also knew I hadn’t opened (or clicked) on any of their recent emails. But you know the old saying, “Knowing is half the battle”? The saying is true, but knowing is still ONLY half the battle. Technology that allows marketers to know what customers are – and are not – doing has existed for years. Some solutions (like Marketo – wink, wink) can even track how anonymous visitors are interacting with your website and mobile devices and serve up personalized marketing content in real-time. That being said, far too many companies aren’t doing enough with relevant consumer data. The other half of the battle is actually using all of that data to build and grow relationships with your audience. 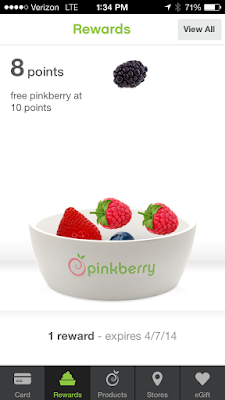 Unlike some brands, Pinkberry took advantage of their wealth of data. They knew all about my online, in-app, and in-store behaviors, and they used that data to provide a better consumer experience. Great visuals. I’m craving a frozen yogurt right now – aren’t you? Short, direct, to-the-point copy. Three short sentences. That’s it. An easy to follow call-to-action. I didn’t need to enter a coupon code, print the email and show it to a cashier, or do anything that would require effort on my part. Instead, they just added a free yogurt to my app. Simple, easy, and effective. A sense of urgency. The free reward expires in seven days. Smart. More on that later. Next, I texted my wife to let her know we’d be making a “special treat” trip to Pinkberry – that same night! But however much I loved this email, I’m a marketer at heart – and that means I’m always thinking about ways to build even stronger relationships. Here are some thoughts about where Pinkberry can go next. If I DO redeem my reward: A simple “thank you” email could be triggered automatically. Bonus: Since they will have the data – thanks to their iPhone app – they could even personalize the email with the flavor of yogurt I purchased with my free reward. If I DON’T redeem my reward: A “reminder” nudge email could be triggered automatically the day before the reward expires. Bonus: Again, since they have the data, why not entice me with a picture of the yogurt I purchase most often? 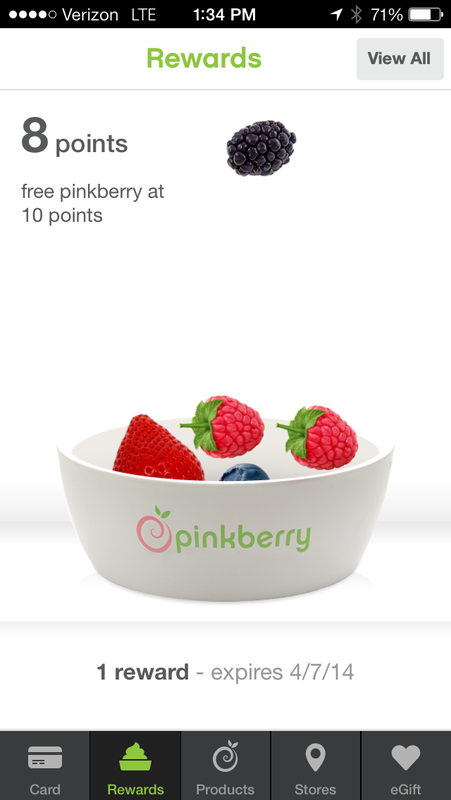 Include a call-to-action in the body of the email encouraging a click-through to the Pinkberry website. Driving email readers back to your website where they can learn more (and buy more!) is ideal. Better? The link within the email should direct me to their products page. Using the data they’ve collected from my purchase history, they serve up (pun intended) pictures of my most-purchased yogurt flavor. Even better? Personalize the website with an ad reminding me that my reward will soon expire. That consumer data is best used to create a personalized, relevant experience. Everybody loves free frozen yogurt. What are you doing to make your messaging more personal and relevant? Have a story to share about a brand using consumer data to its fullest potential? Share it in the comments below.